Day 48: How Not to Present a Professional Image . . . I made mention of this a few days ago but the myriad of arch wires in my mouth are progressively causing me more inconvenience, pain, and most definitely causing me embarrassing moments. :) Read on for further details . . . When my splint was removed, the top surgical hook arch wire was cut in half, right in the middle. This was deliberately done obviously so as to remove the wires that were holding my splint in place. The following day I was to have the surgical hook wire replaced by my Orthodontist and new braces fitted on the top and bottom of my teeth so that my Orthodontist would essentially be able to start afresh for the next phase in my recovery and orthodontics. Given that I have been wearing braces for 14 months or so, combined with the surgical hook wire since my surgery, many of my brace wings have broken off. This is quite understandable given that many of the bands are wrapped around the brace wings rather than the surgical hooks and the pressure of the bands is too much for the brace wings and they consequently break. However, as you have no doubt guessed where this surgery is concerned, things do not always go according to plan! 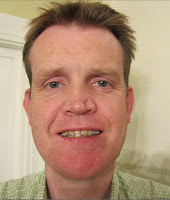 My braces were not replaced (see here for an explanation), nor was the surgical hook wire replaced. Instead, I had another wire placed over the surgical hook wire. The issue that I have been experiencing for a week or so now is that this new wire has become loose and is no longer attached to the surgical hook wires. So, I have pieces of wire sticking out everywhere. I have tried to show this in the photograph on the right (you will have to zoom the picture) and hopefully you can see where half of the surgical hook is above my arch wire and the other half is dangling down beneath this new wire. The new wire is incredibly lose and I find myself pushing it up all the time as it falls down whoever I talk. Let me tell you now that there is nothing like talking to someone whilst simultaneously playing with the multitude of wires in your mouth. Very professional and attractive. My oral surgeon tied one half of the wire earlier this week in an attempt to keep it in place but it is already loose and loose they will stay until I see my Orthodontist later next week. Now I recognise many of you are saying, "it is easy, simply don't put your fingers in your mouth! The problem is that if I do not, then I am then constantly being stabbed by the errant wires which, believe me, is not at all comfortable (remember the wires were cut so each end of the cut wire is sharp!) and it causes me to grimace and flinch! What would you rather have happen whilst talking; grimace and have a nervous tick every time you are poked with a sharp wire or else put fingers in mouth and push up the wires before they stab you? See what I mean. I don't remember the surgeon or Orthodontist talking about this particular issue . . . Finally, as is custom, I need to show you that my diet is improving! I ate (sucked, slurped, and swallowed) delicious salmon, potatoes (boiled), and even corn! Corn by the way is quite impossible to eat on its own but combine the corn with beans and they are far easier to eat!